Inasmuch as I dislike making certain connections, they are there and I cannot ignore them when I see them. On October 2nd I did the usual, collected those comic strip bubbles that appealed to me (for whatever reason), then put them into a collage, then selected the text I wanted to anagram and made the connection to some news found on the internet or TV. The connections had to do with a couple of women from the US who happened to be in Italy when the anagrams came together. This is the comics collage from October 2nd. Outlined in the light purple color are texts chosen to anagram. I often use portions of the same collage for different anagrams or just one. The following is the lengthy anagram using the words found within the light purple outline above. This link which I saw posted today, connects the latter part of the anagram. On August 18th, I read an article and shared the link on my Facebook page about an experiment based on Stanley Milgram’s “Small World” experiment. Milgram conducted his “Small World” experiments in the 1960s, an experiment designed to test the hypothesis that anyone in the world can get a message to anyone else in just “six degrees of separation” by passing it from friend to friend. The Yahoo-Facebook experiment aims to test whether the degrees of separation between people are as few as Milgram and other investigators concluded. Anyone with a Facebook account can participate in the Facebook-Yahoo experiment by going to the site. When I started this particular post I had not yet been to that site, figuring I had completed my own version of the facebook-degrees-of-separation, but I did go there just to copy the information about what the experiment was, not to join the experiment. Obviously mine is a very different kind of connection. I make connections all the time, whether it is due to magical thinking, a real unusual sense of pattern documentation or just plain coincidence. 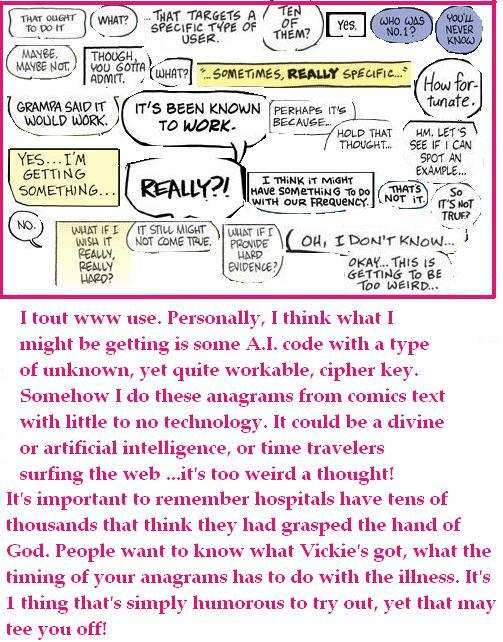 I’ll call it an awareness with a twist in that I document my connectivity using comics and anagrams and comments about what I find. I know it sounds weird, but surely there must be science in this somewhere? Here’s the thing. If I were a mathematician, I could probably have figured out my own probabilities years ago, but instead, I document through a more visual method. Here is the my Milgram/Facebook coincidence. After the August 18th article was read, I really did not think about it any more. I continued to read the comics daily, and did that other thing I do, took photos on a couple of walks. At times, when I take photos, I am aware I am taking it for another “purpose” though explaining this would be difficult. 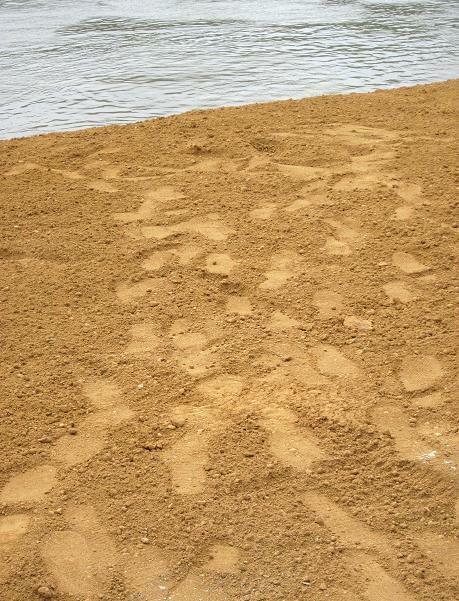 On Labor Day, I took a walk along the Ohio River and later uploaded some photos to my facebook page. I added more the next day, as “leftovers”. This is where connection number one comes into play. On September 6th, a cartoon showing the backside of three letters of the alphabet in a courtoom situation, the judge stating they were out of order, caught my eye and I posted about it on facebook. I did not tell anyone that in order to take the photo of the backside of a metal sign, I had to push past my vertigo to walk up a metal ramp then get myself into a weird position on the floating platform. This is not something done easily because of my vertigo, because it feels as though everything is moving. After seeing the cartoon and making the backwards letters connection in my own way, I looked up the name Adi, to see what it meant. I found a couple of other ways to write it, one being the Hebrew spelling and the other a Chinese tattoo. I don’t read Hebrew or Chinese, so this was just another connection to me in the form of text art, which is what my comics collages and anagrams are to some extent. We will call it connection number two. I realize this makes no sense to a lot of people reading this, but stay with me here. I went through the trouble of documenting all of this. Yeah, I took 3 letters from the name of a city and used them to look up a name, so what? Here is the next “what”…connection #3. 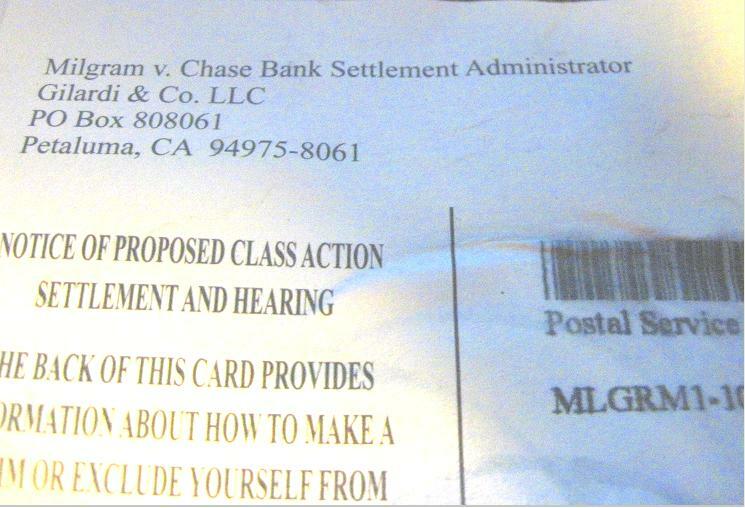 Yesterday I received a post card in the mail regarding a class action settlement that seemed a little unusual. I did use the postcard as a drink coaster last night, but have no plans to do anything else with it but throw it out. Oh, I know, that is not the proper way to exclude myself from the settlement, but I already got what I needed from it…the name Milgram. I don’t know if others would call this 3 degrees of separation at this point, but let’s just say I did receive something in text through the US Mail, and it has the name “Milgram”on it. This morning, having prepared my coffee and checking my Facebook feed, I discovered that a “friend” had just “friended” a person named, of all names, Adi. 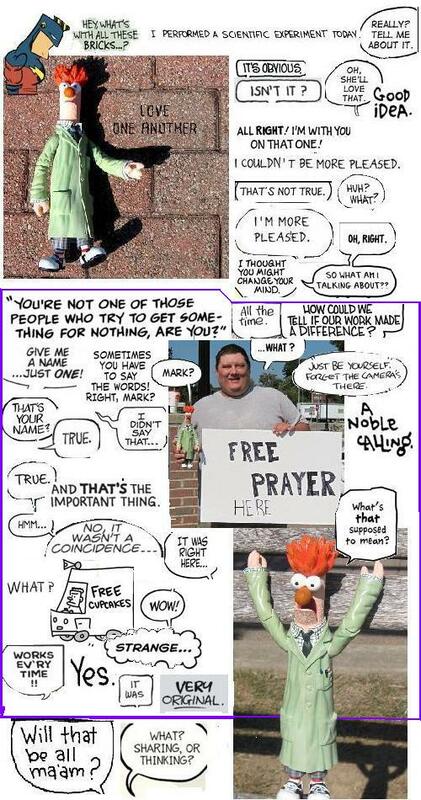 I ask those who do this sort of thing, is that the requisite steps #4 and #5 that the original Milgram discovered? Sometimes I don’t realize how fast the days and weeks are ticking by, until I look at the next big event that comes up. Milestones in life, I mean. A daughter will soon have her wedding ceremony…time flies. I have not written on my blogs in a while, and I found out recently that a couple of them are now gone. I should have written everything in the computer first and then uploaded, but I did not. So now I wonder how important it is to remember those things I wrote about over the past few years. If I cannot remember, and nothing refreshes my memory, what will I have to look back on or think about as I age? So little is available to even prove I have existed. No one really knows me so maybe it doesn’t really matter. The text for the above anagram is within the turquoise-colored field. I have apparently misplaced a set of keys. 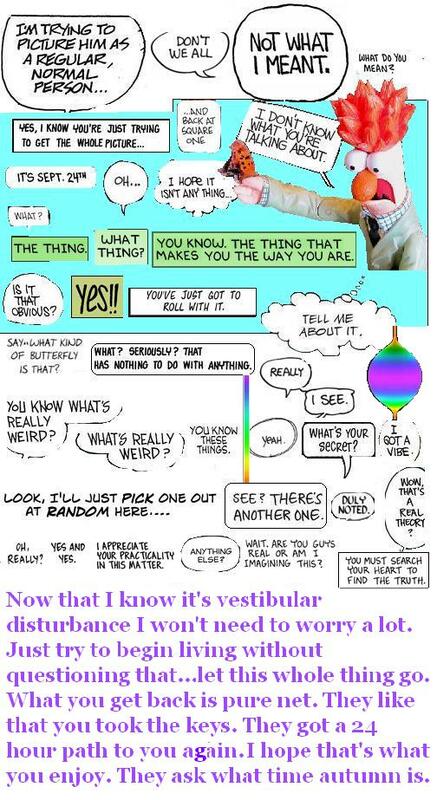 Earlier today I had the ENT tell me the results of the ENG…it showed I have a severe vestibular disturbance. Well other than the name, it isn’t news really, but it tells me where this thing is in my head that causes my spin. It’s a start to trying to live again. And yes, autumn is my favorite time of the year,…it is that. “Today I see many men in a darkness. Some plan to use an oil drill…I think it may work. A family says words effect you…you may seem to sway today. Though Vickie uses more than enough text she appears to have methodically good daily results regardless the number of letters, so her unconscious mind is receptive to inexhaustible multisensory input. The body of her work is a true testament to the ultimate statistical anomaly being measurable only to the extent it is an unknown. 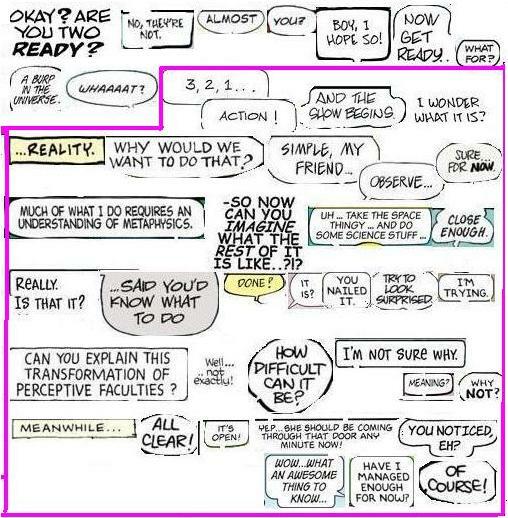 The anagram above comes from the comics text bubbles seen below. The anagram above was made using all the letters seen in the purple box of the comics collage I made today from comics found today. I have “The Event” on NBC as I write this entry. Last night, the preacher and his wife handed out cupcakes to people as they left church, but I did not take one, so there would be enough for others. I met a person today on the sidewalk, and I assume I have his identity correct, though he did not tell me his name. He did, however, tell me he has a gnome that he and his wife take with them on vacations, to take photos of him, kinda’ what Beaker was doing. The young man said his father used to call him Beaker when he and his father would work together on projects, so he wanted to pose with Beaker for the photo op. I hope you enjoy the collage and anagram.